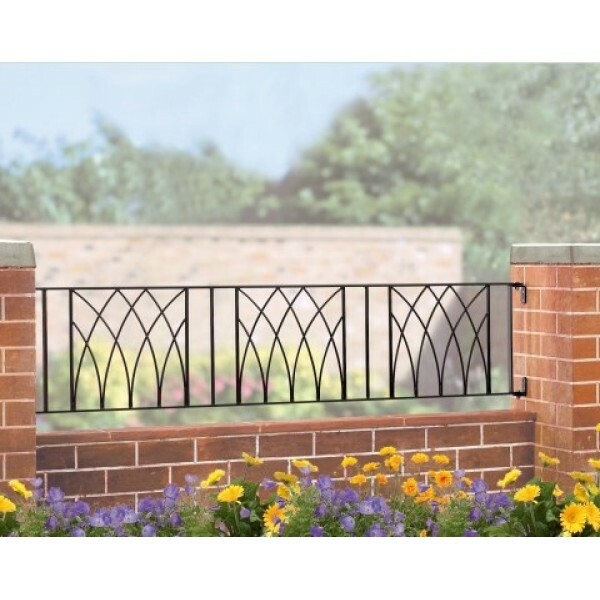 The Abbey Railings are constructed using solid steel for a traditional wrought iron railing appearance. The decorative design creates an attractive wall mounted railing at an affordable price. This railing can be supplied with either a primed or galvanised and powder coated finish. If our standard size won't fit, a made to measure service is available for this railing. For the width, measure the gap you have between your pillars or posts. If you are replacing an existing railing panel, do not measure the railing itself as this will not take into account the space for the hinges that are supplied and required for installation. If you are building a new wall, ensure you leave a gap between your pillars of exactly 1830mm (6ft). If your gap is more or less than 1830mm (6ft), click on the made to measure button above where you can have the railing made to your exact measurements. Primed. With a primed finish, a black undercoat is applied at the factory. The railing will then need to be painted before installation with a suitable exterior metal paint, such as Hammerite, then repainted every 4 or 5 years to protect the metal. This option allows you to paint the railing in any colour of your choice. Galvanised & Powder Coated. With this option, the steel is electro-galvanised to add a thin layer of zinc on the steel to prevent rust. The railing is then powder coated in a black paint to give a smooth satin finish. This option allows the railing to be installed straight away and will be maintenance free for 5 to 10 years. Once rust starts to show, the railing should be painted with a suitable exterior metal paint such as Hammerite. Fittings. The Abbey Railings are supplied with hinges. Please note the hinges require a flat vertical surface for installation.